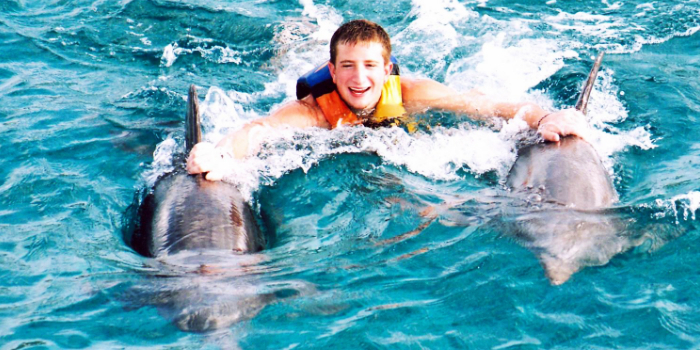 Have you ever wanted to swim with the dolphins all on your own so as to become a part of their world? In the Signature Dolphin Swim experience, you not only have the chance to swim with the dolphins, but you can actually feel like you're one of them. This experiences allows you to connect with the dolphins and really get to know them as you explore their habitat. Our tours are unique in that we enforce a small group policy. We want to make sure each participant in a given tour is able to receive an intimate and personalized experience. 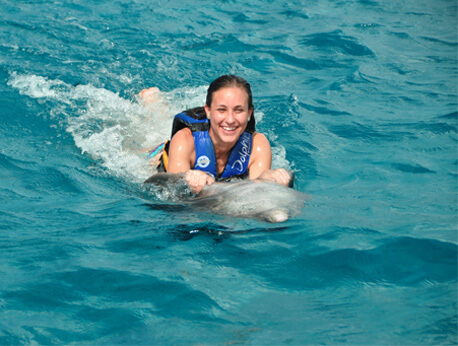 Before you are immersed in the water, you will be introduced to the dolphins and their lives underwater. 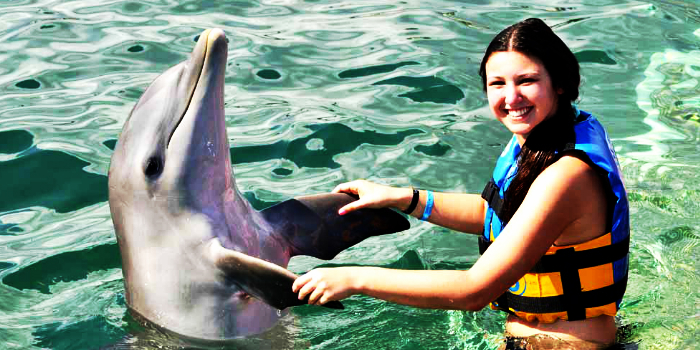 Then, we will teach you how to use proper hand-signals to communicate easily with our dolphin friends. Our use of positive reinforcement and unique hand-signals ensures the dolphins understand what we’re saying and that they feel happy playing and spending time with our guests. You’ll be able to swim with, play with, and even ride the dolphins through the water. An experience like this will connect you and your family to the marine animal world in a way that you could never have imagined. 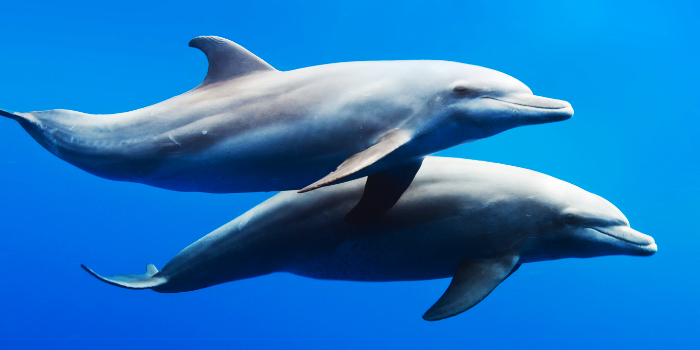 As you become comfortable in the water, the dolphins will come alongside you as you freely swim in their habitat. 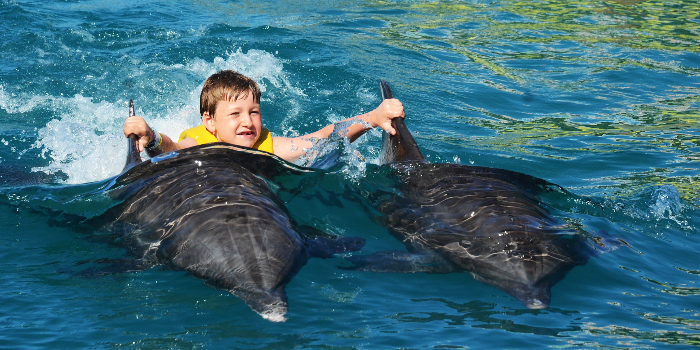 In this Signature Dolphin Swim experience, you will have total freedom to swim with the dolphins, feel their slippery skin, and play with them all on your own. Become part of their world and feel like a dolphin yourself as you glide alongside them. You may even grab on and let them gently pull you through the pool under the water. If you are looking for an opportunity to swim on your own with dolphins, then call to reserve your Signature Dolphin Swim today!